Fallish type weather has moved into our area. It has been a great relief. I am excited to be done with all the fall decorating and so I can focus on other projects I need to complete. It is hard to believe we are moving into the busy time of year for projects. I know there will be so much to share between now and the end of the year. This week highlights are all DIY projects. One More Time shared with us how to make these amazing palm leaf pumpkins. 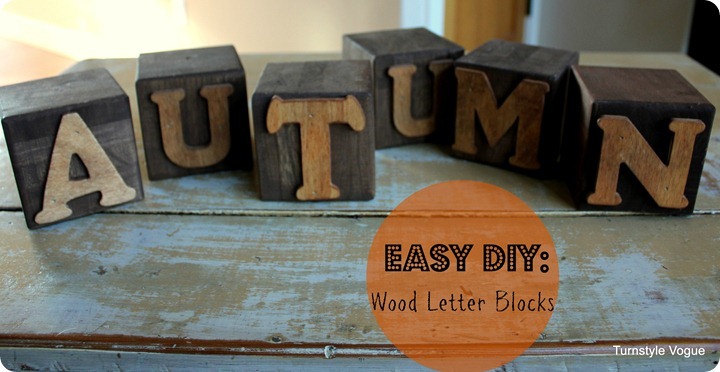 Turnstyle Vogue shared with us how to make these seasonal wood blocks. Sweet Boutique shared with us this beyond fabulous cake! Yes, I said cake!! 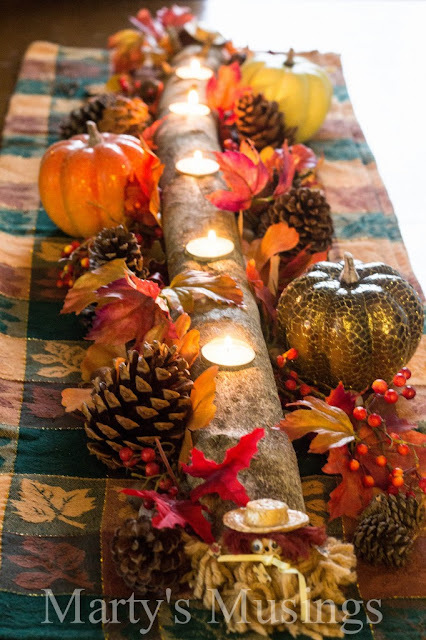 Marty's Musings shared with us how to make this awesome branch votive holder. Number Fifty-Three shared with us her beautiful fall entry way. She even showed us how she made that awesome owl silhouette! Hi Pam! Thanks for hosting :) I need to try that candle/wood trick. I have enough wood, that is for sure!! Pamela, I made it! Thanks so much for hosting!! Lovin' how those palm leaf pumpkins looks...what a neat idea! !Thanks for hosting Pamela. Thanks so much for hosting and thanks so much for your visits! 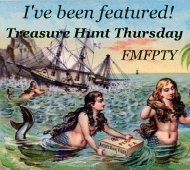 Hi Pam, just linked up, thanks for hosting, love all the fun Fall features! Such great link ups already, I love all the Fall/Halloween entries. Thanks for hosting! Well, you've certainly brought Fall to us in a big way. So many great ideas. Thanks so much for taking the time to host the party. It is much appreciated. Such great ideas for Fall! I love it. Thanks so much for hosting and for featuring my entry! Hey Pamela, thanks so much for the shout-out on my wood blocks. All of your picks are awesome. Thanks for the opportunity to share. Have a great evening! Thanks Pamela for having such a lovely party! Love all the beautiful features. Hi Pamela! Oh, look at all of these wonderful fall things! I'm drooling here and am looking forward to checking out your party goers.Thanks for popping in to see me. Loved seeing your sweet smile! Thanks for featuring my branch candle holder. It's such a lovely fall project. Thank you also for hosting each week! Thanks for hosting. Great features this week, the Wood Letter Blocks really spoke to me and I loved looking at all the features as well. Hi Pamela, thanks for hosting such a great party. Love the features. So glad I could join in. Pamela, you always have inspiring features! Thanks for hosting! I'm so happy I could join in on the fun! Hi Pamela....loved the features! !....Thanks for hosting! Thank you so much for the feature on my Palm Leaf Tablescape. All the features are great...off to visit them. Thank you for hosting. I'm linkin gup for the first time in awhile. Had fun thrifting last week, and sharing my treasure trove. Thanks for hosting a wonderful par-tay. Thanks for hosting! Have a fabulous week dear! The telephone table foyer is so cute! Thanks so much for hosting this party! I am glad I found you. we are now your newest follower. Those are some great features. I really like the branch votive cup holder! thanks for letting me know, I've linked up again. Love joining you for your fun party! Thanks for letting me join the party. Lots of lovely blogs to have a look at now! love that gossip chair. I have one that I want to redo.